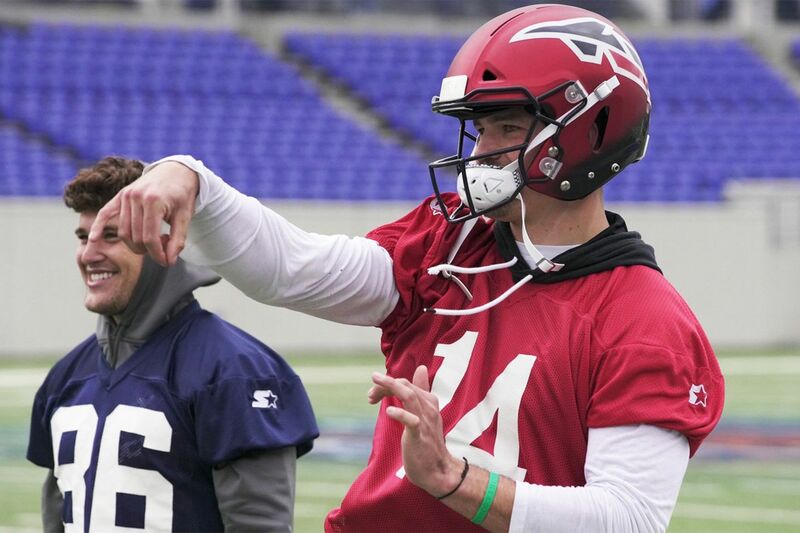 Former Penn State and Eagles quarterback Christian Hackenberg will start for the Memphis Express in the all-new Alliance of American Football. The NFL season may be over, but football fans looking for something to fill the void can tune into CBS tonight for the debut of the Alliance of American Football, a new spring football league hoping to succeed where so many others have failed. Haven’t heard much about the AAF? That was sort-of intentional, according to Charlie Ebersol, the league’s CEO. Ebersol, a film and television producer who directed ESPN’s highly praised 30 for 30 documentary This Was the XFL, said he didn’t want the Alliance to follow the failure of the XFL, which debuted in 2001 to monster television ratings that eventually cratered without a real product to support the interest of football fans. “Spending $40 million marketing a league that couldn’t possibly have football that lived up to the hype was really at the heart of our decision,” Ebersol said. “I think it’s very important that when fans and viewers tune in for the first time, they see quality football and a broadcast they can relate to." Ebersol is serious when it comes to the league’s commitment to quality football. Not only do all head coaches have NFL coaching experience, Ebersol turned to Hall of Fame NFL executive Bill Polian to develop and manage the league’s approach on the field, along with a competition committee that includes former NFL stars Troy Polamalu, Hines Ward, and Jared Allen. The Alliance’s eight teams are divided into two divisions, mostly scattered throughout the south in cities with no local professional football team, such as San Antonio, Birmingham, and Memphis. Four teams will eventually make it to the league’s playoffs. The season also kicks off tonight with the Atlanta Legends taking on the Orlando Apollos at UCF’s Spectrum Stadium, but that game isn’t being broadcast in the Philadelphia market. Calling that game for CBS will be play-by-play announcer Andrew Catalon and longtime SEC analyst Gary Danielson, with sideline reporting by Melanie Collins. Here's the CBS Alliance of American Football map for tomorrow night. Former Giants running back Tiki Barber will call tonight's Alliance of American Football debut for CBS. Calling tonight’s game will be former New York Giants running back Tiki Barber, who will act as an analyst alongside former NFL quarterback Trent Green and play-by-play announcer Spero Dedes. Barber said he had a chance to watch all four of the league’s preseason games, and came away impressed with the level of play. Unlike NBC’s coverage of the XFL back in 2001, CBS is taking a serious approach to everything surrounding tonight’s broadcast, including a traditional pregame show at 8 p.m. that will feature Hall of Fame quarterback Kurt Warner and SEC sideline reporter Jamie Erdahl. And in a symbolic nod to the professionalism it wants to bring to Alliance games, all of the network’s on-air broadcasters will don traditional CBS blazers. Starting the Memphis Express’ matchup at the Birmingham Iron on Sunday at 4 p.m., CBS will begin an 11-week run airing Alliance games on the CBS Sports Network. CBSSN’s broadcast crew consists of play-by-play announcer Ben Holden, analyst Adam Archuleta, and sideline reporter John Schriffen. The league will then return to CBS to air its championship game from Sam Boyd Stadium in Las Vegas on April 27. “We wanted to put some of our best people on those games, not only on the broadcast games but also on the cable games,” said Dan Weinberg, executive vice president of programming for CBS Sports. Alliance games will also air twice a week on the NFL Network, beginning with Sunday evening’s matchup between the Salt Lake Stallions at Arizona Hotshots at 8 p.m. Calling that game will be Dan Hellie, Maurice Jones-Drew, and former Cincinnati Bengals head coach Marvin Lewis. The Alliance also has a broadcast deal with Turner Sports, which will air one regular-season game and one playoff game each year. One game a week will also air on Bleacher Report Live, starting with a Feb. 23 matchup between the Arizona Hotshots and the Salt Lake Stallions. While the Alliance of American Football's rules are mostly similar with the NFL, there are a few notable differences. While Ebersol said he intentionally wanted the Alliance to feel as close to an NFL game as possible, he and the league’s executives did carve out some incremental but notable differences in their rulebook. Most of the changes were made with the intention of speeding up the rate of play, including reducing the play clock to 35 seconds and placing restrictions on which defensive players can blitz for safety reasons. There are also no extra points in Alliance games (two-point conversions are mandatory) and the league has done away with kickoffs, choosing instead to have teams simply begin new drives from their own 25 yard line. Getting rid of kickoffs also means abandoning the onside kick, but Ebersol and Polian devised a work-around. Called an “onside conversion,” if a team is trailing by 17 or more points within the final five minutes of the game, they can attempt to convert a fourth and 12 from their own 28-yard-line. If they’re successful, they keep the ball. If they fail, the opposing team gets the ball at the 28-yard-line. Many fans won’t remember most of the former Eagles players who will take the field for the Alliance tonight, since most were relegated to the practice squad and never played a down with the team. That being said, the Commanders have a number of ex-Eagles players, ranging from former wide receivers Darius Prince and Greg Ward Jr. to cornerback De’Vante Bausby. Their cornerbacks coach is Bill Bradley, who played in the defensive backfield for the Eagles in the early 1970s and still holds the team record for most interceptions during a season (11). Meanwhile, the Fleet also have a number of former Eagles players on their roster, including offensive lineman Darrell Greene, cornerback Ron Brooks, and running back Terrell Watson, who scored his only career touchdown on a one-yard run against the Dallas Cowboys during a 27–13 win during Week 17 to end the 2016 season. The most notable former Eagles players in the league are wide receiver Josh Huff (Arizona Hotshots), and quarterback Christian Hackenberg (Memphis Express). Michael Vick was to be offensive coordinator of the Atlanta Legends, but the team said Thursday that the former quarterback wouldn’t serve in that role.